At every convention, there are always pleasant things, some bad things, and some downright tragically awful things. 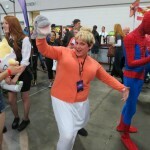 When you go to a convention in cosplay, all of those things become amplified to a whole new level up! You gain insane amounts of EXP and go through a few lives, but it’s all worth it in the end. 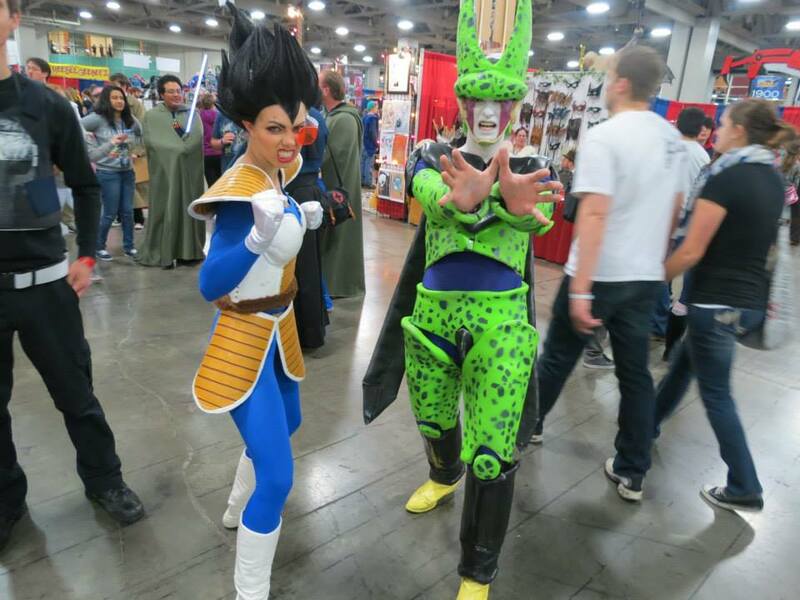 Here’s a snippet of our cosplay experience at Salt Lake FanX 2015. You get to cosplay. Any cosplayer understands this perfectly. Whenever you have an opportunity to show off your hard work, you’re stoked! And when that moment is at a convention where you are surrounded by other amazing cosplayers, you float to cloud 9. We make these cosplays for a convention, so regardless of what icky things may happen, we are still just so excited to be frolicking around con in our fun new outfits. Confriends. 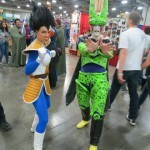 I’m not sure what the local cosplay scenes are like in other states, the Utah cosplay scene is so tight-knit, friendly, and loving, that you can’t walk anywhere in a local con without running into at least 20 people you know every 5 minutes. 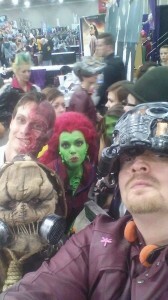 The comeraderie was by far our favorite part of FanX. We have made so many cosplay friends and seeing them all in one place is one of the greatest experiences ever. Admiration and recognition. 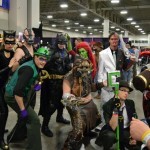 When in costume, especially recognizable and fan favorite costumes, you will be stopped to have your picture taken. It’s an incredibly common occurrence at con, and another one of our favorites. What’s even better is when a little child recognizes your character and grinning from ear to ear, asks to take a picture with you. A stranger phenomenon that happened to us this year was walking around artist alley and having artists like our costume SO much that they gave us free posters. It was by far one of the nicest forms of flattery, and we were truly grateful to be noticed and appreciated. It’s also a heartwarming experience when the Kingslayer can’t finish your autograph because he can’t stop staring at and admiring your body paint and cosplay (HHHNNNNGGGG). Costume malfunctions. Along the lines of getting into costume, you will inevitably have wardrobe malfunctions. Usually they’re not quite Janet Jackson at the Superbowl malfunction, but they’re just as awful. Our Vegeta cosplay always gives us trouble, and we somehow forget to address these issues for the future. 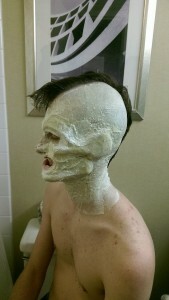 The shoulder pauldrons don’t want to stay on, the wig starts falling apart, and your make-up is smearing. It’s almost a constant war with making the characters actions for photos and praying to the cosplay Gods that your hot glue will hold this time. Our Scarecrow was another leaky issue we had. Literally. 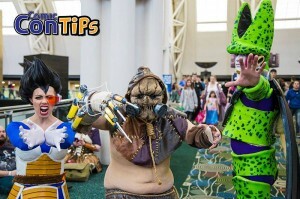 Scarecrow’s fear toxin in his fear injectors decided it wanted to ooze out and kill everyone at con (not literally). Various other parts of the costume continued to disintegrate as well throughout the con. Then our Two-Face has to fast (not by choice) during Saturday since his lip piece did not allow for sufficient swallowing and eating…But alas, you are more than determined to be that character and will continue onward until every last piece falls off of your body (or until you’re escorted out by security – that did not happen). Mass Exhaustion. The absolute worst part of con is the insane amount of exhaustion you feel at the end of each day and at the end of the convention. After the exhibit floor closes and you meander back home or to you hotel, you can’t help but drag your feet and moan as if you’re a zombie. Once you get some food into your system you begin to regenerate, but each long full day of cosplaying, meeting up friends, rushing back and forth to panels, having pictures taken, and the entire effort of being at a convention ALL DAY FOR THREE DAYS will wear you down. It will wear you down to a point past exhaustion, where you are so wired and tired at the same time that you can’t decide if you should sleep or stay up for the next 10 hours. We usually, to the detriment to our sleep schedule, choose the latter. But it’s ok! Because that next day after con ends, you can (usually) just plop onto a bed and sleep all day. Sure, you smell and haven’t showered properly. And sure, you likely have makeup melted all over your face, but that sleep is the most dear and wonderful sleep you will ever have. Ever. Often times after a con, we’ll get “con crud” which makes that exhaustion last much too long, but somehow our group all managed to avoid it this time. (which doesn’t make sense since we had an average of 10 hours of sleep over 3 nights, the worst diet ever, and touched ALL THE THINGS). 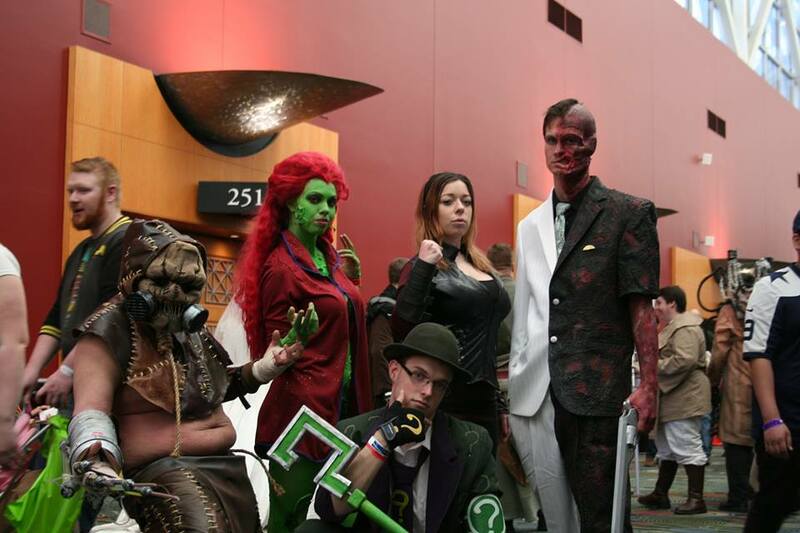 All in all, FanX was fabulous and we wish it was every weekend. In the meantime, we will prepare new cosplays and daydream about Salt Lake Comic Con in September. 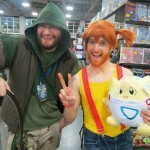 Have you cosplayed at a convention? What experiences do you love/hate about it? Beware our power, Nerds of Play take flight! The Nerds of ‘Play are a band of 5 misfit cosplayers based in SL, UT that come together to create mischief, mayhem, and incredible cosplays. 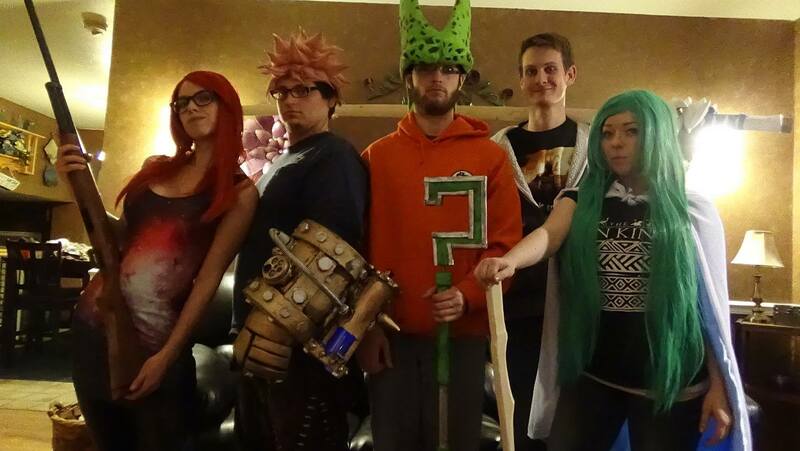 With enough cosplays planned to get them through eternity, these Nerds still manage to find time to fight through the water temple and train their pet dragons (Daenerys could learn a thing or two). They consist of an alien from another planet (or so he’s convinced) who is searching for the tardis (containing Karen Gillan, of course), an indestructible nerd-knowledge think tank who will mega evolve all of his Pokemon, a master sword wielding she-halfling that we can’t seem to get rid of, a borderline evil tech-scientist/engineer who is likely building a robot to take over the world as we speak, and an overly logical she-geek who insists on being ALL THE CHARACTERS, regardless of their gender or species (seriously, we’re a little worried about her identity crisis). 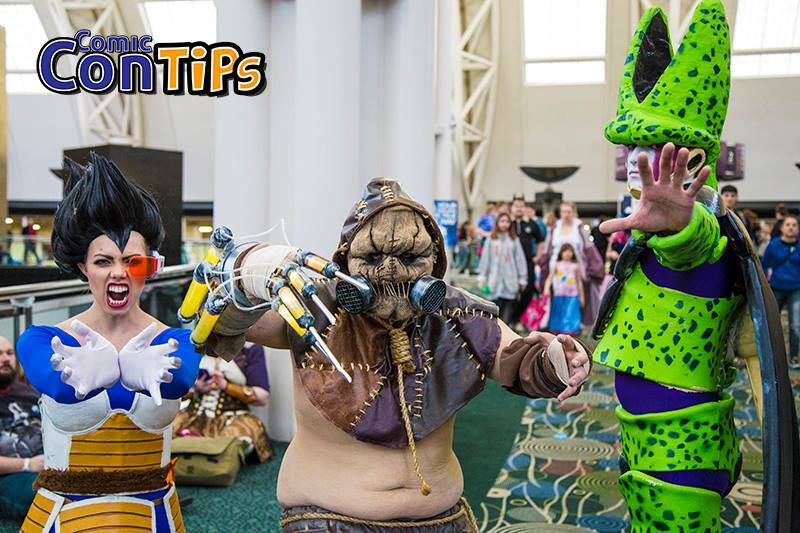 Together they will take over the (cosplay) world, or at least their own fantasy worlds…. 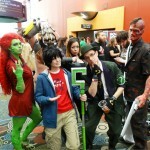 Find them here, on their official cosplay page (www.facebook.com/nerdsofplay) or lost somewhere in time. Welcome to the Geekdom.